Sophie Macpherson and Clare Stephenson, ‘Shoplifters, Shopgirls’, 2010, production stills. Courtesy Sorcha Dallas, Glasgow. Steven Cairns: You are collaborating on Shoplifters, Shopgirls, a project that exists within the parameters of theatre, rather than a gallery. How does it relate to your work as individuals, and how have your interests merged? 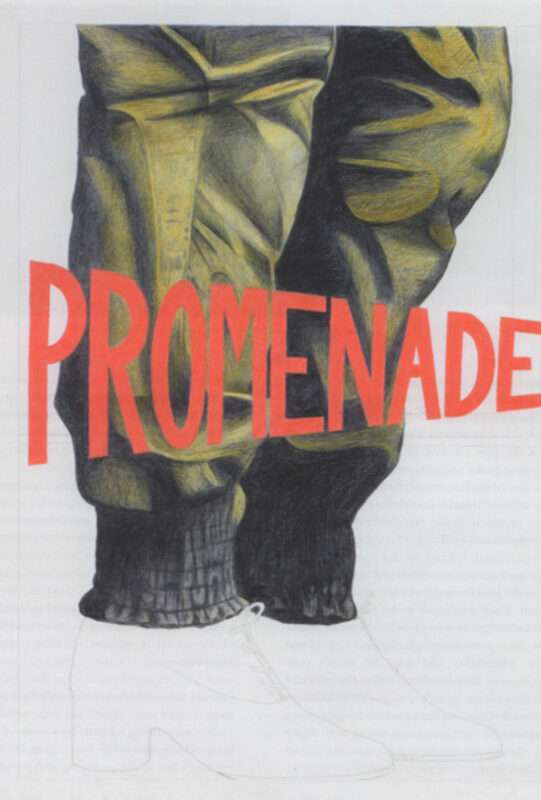 Clare Stephenson: We both make work that has theatrical connotations, but it has always been specific to the gallery. It wouldn’t operate in the same way if we simply transferred the existing elements to the theatre, so we focused more on the actions of the artist as producer, consumer and performer, among other things. Macpherson: Participation has become a bigger part of my work; it’s a progression that has happened over the last four years. I think it’s related to being in a band [Muscles of Joy]. The screens or the sets I made in the past are like empty stages, and the viewer participates with the work physically and sculpturally. Also, I’ve always photographed myself with the objects I make (and recorded these relationships in recent films) but doing theatre is an opportunity to make it live. 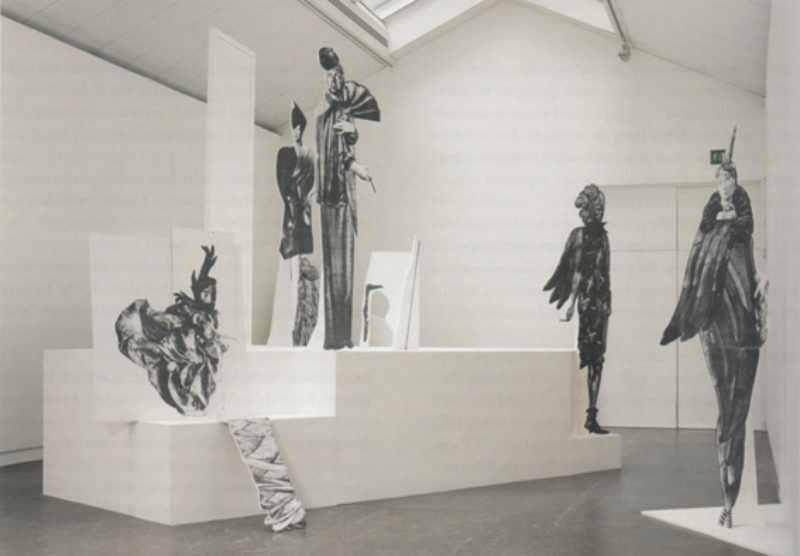 Stephenson: I see the screenprinted wooden figures I made in the past few years as allegorical or pseudoallegorical. They don’t need to be objects as such; they are a set of proxy selves that talk about the presentation and production of objects, and labour processes, materiality and also the artist’s positioning. Because they are theatrical in the gallery it didn’t seem to make sense to just put them on stage. But admittedly there is a strong relationship between this project and our sculptural works and object making; the investment in objects, and the values you put into them. Cairns: Sophie, in your show at Sorcha dallas at the beginning of the year, the idea of performative action was alluded to in your video and 16mm work, ‘A Series of Movements’, 2010, but it was also contained—in the case of your 16mm work, by the surface of the projection on the wall; in the video, by the sculptural frame of the monitor. Macpherson: I used 16mm for that purpose—for its materiality. It’s sculptural, and I wanted to deal with that materiality by positioning the projected image alongside the wooden construction. I structure my films and videos like a series of vignettes that hopefully share something in common—they are woven together. We ended up structuring Shoplifters, Shopgirls in a similar way, as a series of performances. 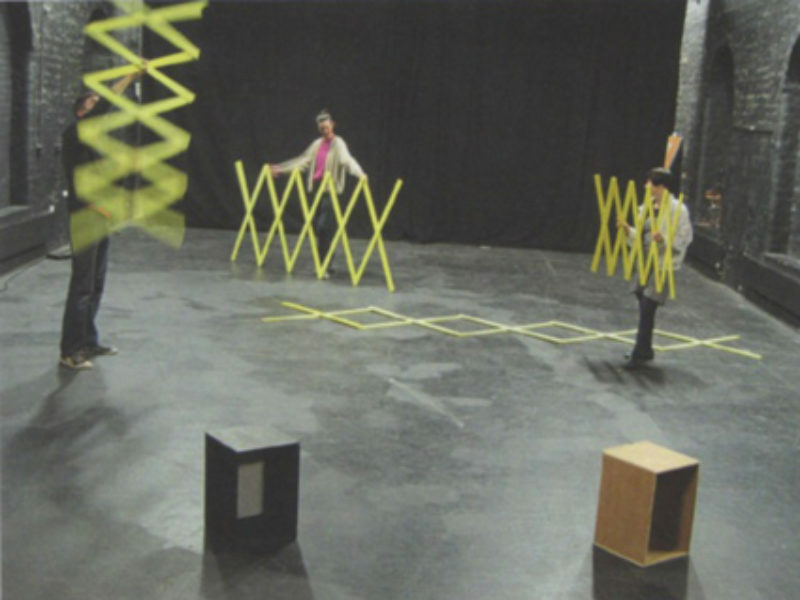 It sometimes felt like we were making a massive, moving, installation at Tramway. Cairns: Communication through fashion or costuming is often more significant than verbal language. This is something suggested in both of your practices, and I wondered how those ideas married together when you were dealing with people on stage? Macpherson: The video ‘deep dancing’, 2010, I made last year was the first to employ sculptural objects, homemade, quite stylised, garments and coloured text posters. 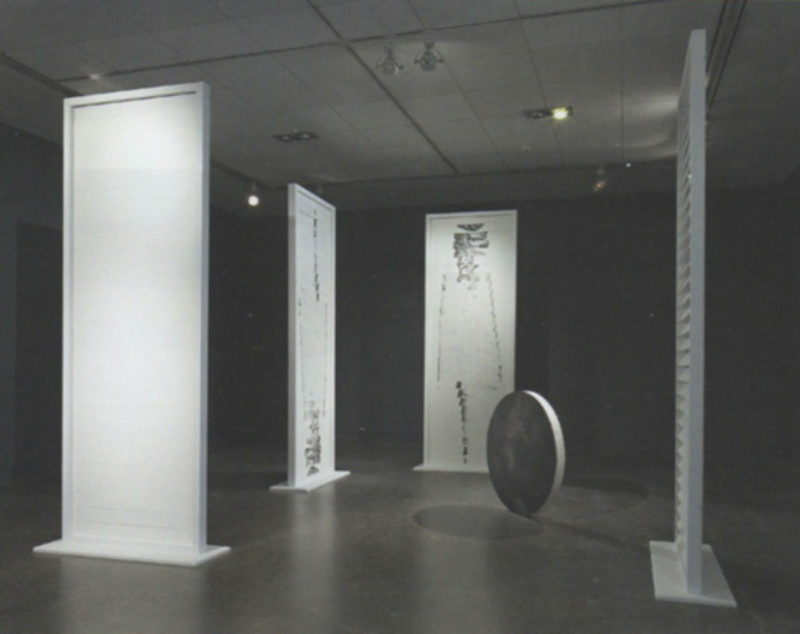 I was attempting to redefine their functions and languages, and explore the nonverbal and mute qualities of symbols. In ‘A Series of Movements’, I explore everyday behaviour and abstract action. Shown on a looper, repeated actions became ritualistic and theatrical. We altered shop-bought garments especially for the performance, and some movements specifically related to how they were worn. Also we wanted to have a distinction between something tightly choreographed and more functional actions. Stephenson: I’ve actually removed all visual references to my figures, partly because I thought they would interfere with the reading of the piece as a whole and with the performative nuances of Sophie’s work. So they only appear in dematerialised form, as part of a monologue delivered by artist Michelle Hannah. Cairns: In what way are you dematerialising the works? Stephenson: The works talk about processes surrounding objects; they aren’t necessarily supposed to be objects themselves. There is an absent, mythical object that they refer to, and I think I’m doing a similar thing with the monologue—stressing the performative side of artistic practice. Cairns: Three genres come to mind: performance, theatre and expanded cinema. I wondered what you thought of each of those as distinct categories? Macpherson: I don’t think Shoplifters, Shopgirls relates to performance art; we tackled theatre, the theatre space, and the principles that come along with both of these things. Stephenson: It’s a shift in context that reflects back on our work—a shift that gives us a new set of problems. Macpherson: We produced our own staging to counteract Tramway’s theatre space, and hung a giant pleated curtain that looks a bit like a skirt. It has a relationship to the traditional architecture of the theatre but also an intimacy in that it relates visually to some of the performers’ garments. 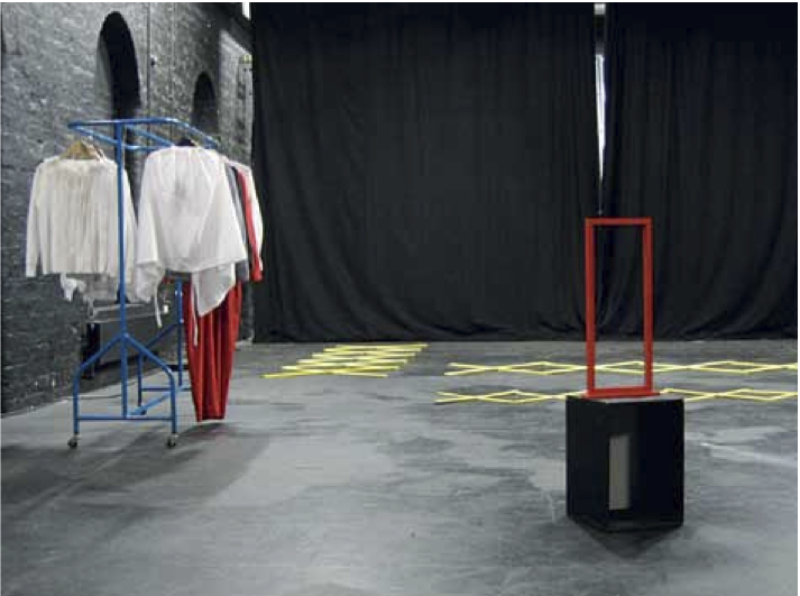 Cairns: You impose your own theatrical attributes onto the space, which would otherwise appear quite anonymous. It recalls a period perhaps when stage theatres were converted into cinemas, but now we are in reverse: you can watch live theatre beamed into the cinema. I think we are at a curious point to take a snapshot within those contexts. Stephenson: The films featured in Shoplifters, Shopgirls relate to being in the theatre, we filmed in the dressing room with objects that are also used on stage. Macpherson: The 16mm film we shot there features a figure lying across table tops in an adapted pleated white tracksuit. The event occurs in front of a screenprinted backdrop that Clare constructed. The film feels almost like a durational piece—a looped projection of a person lying in complete inaction, which offsets the amount of action on stage. This was running as the audience entered the theatre. Cairns: I wondered where gender comes into it? Macpherson: One section of our production revolves around a text work called ‘Clothes and Emotions’, which is a biographical spoken word piece. Although it might be assumed as a female voice, we asked a male actor to deliver the lines. This is to do with distancing of the actual voice but it is also a change of gender. It’s also the only male voice in the performance, though there are male performers. Stephenson: The performers we cast were just people we wanted to work with on-stage. We asked people with certain skills. Leigh Ferguson did some guttural singing; we spoke to Michelle about actors’ vocal techniques, which then fed into the text piece I wrote for her, and Alex Pollard often performs with Iain Hetherington. We also asked Ann Bowman to develop her interest in contemporary songwriting in a live performance for this event. Cairns: You talked about your own investment of time and space, this falls under the umbrella of both of your thinking and intuition. The audience is requested to view the piece beginning to end. That’s totally different from someone going into a gallery, where they may choose to look at a work for 2 minutes, or 5 seconds, or whatever. The idea of performance imposes duration, wherein an audience encounters a relationship with the work. Thinking about this, I wondered what you thought about this interpretation of such issues? Macpherson: We chose to use the big theatre in Tramway, though other possibilities were considered. This decision came with its own rules and expectations that we were happy to be challenged by. There was a certain linearity to the piece, an accumulation of objects but then there was also repetitive movement with objects and clothes, ritualistic singing of phrases and throughout the piece the large curtain was brought across the stage to interrupt the physical and temporal space. I see it from the point of view of the people in the performance—their experiences of it and their participation. We wanted them to enjoy it. Thinking about the audience is also important, but maybe it’s secondary to the participation of the performers and the enjoyment of that participation. Stephenson: This has been quite experimental for us, and it is quite personal. There is a biographical element to what Sophie does, and in the performance I presented old work in a new way. It was difficult to judge how much prior knowledge of our past work the audience needed. We wanted it to be visually exciting and entertaining—that’s part of the ethics of the work. It isn’t completely utilitarian and there are bits that aren’t necessarily conceptually tight. Macpherson: The spontaneity of what happens in those moments on stage is essential: how nervous that person is, or how brilliantly that person projects their voice. The actual performance of Shoplifters, Shopgirls was an experience for the performers as well as the audience and that’s what is so exciting for me. Steven Cairns was co-editor of MAP 2008-2011.